Comark’s PDQ400 waterproof digital thermometer has a quick response time of six seconds or less and comes with a five-year warranty. It is highly accurate to 1°F and is field calibratable. High accuracy ± 1°F, 0.5°C. Waterproof. Dishwasher ready. Meets new FDA food code requirements. This thermometer has wide range of features and is popular seller. It has a fast response time of under 6 seconds and is backed by Comark's 5-year warranty. 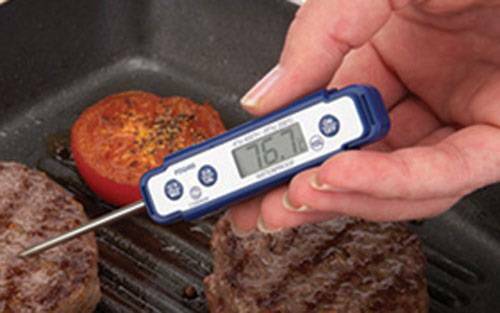 New FDA Food Code requirements mandate that a thermometer with a 1.5mm tip be used to measure foods that are ½ inch thick or less. Have used comark for years. I tried others but always go back to them. Latest was to replace the PDQ400 that some "idiot" melted!! Best Thermometer I have ever used. Super-fast, small, accurate, and calibratable. I also have the Comark PDT300, which is about the same but for the minor price difference, I would opt for the PDQ400 due to the higher accuracy. I have used both at the same time and they come up with the same results; try that with an analog thermometer! I heard after my purchase Comark is owned by Fluke, which the name is synonymous with high quality. Highly recommend!